You go beating on the windows of the bedroom and you awaken them, now you’ve disturbed their sleep, you’ve wakened them up, you’ve disturbed them, you’ve made them uncomfortable because you’ve awakened them in the middle of the night and you’ve told them their house is on fire. Do you hate them because you’re doing that? I would say that you’re actually expressing love, profound love, by awakening them to something that is very destructive and liable to take their lives. 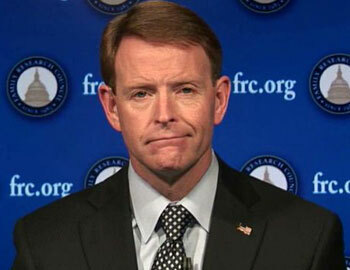 Again, Tony has no evidence for his claims of “homosexual behavior” being “destructive.” Most of the problems that plague the LGBT community — like higher rates of depression and suicide attempts, as well as problems with substance abuse — have been directly scientifically linked to the sort of anti-gay stigma that finds its societal origin point with hate group leaders like Tony Perkins. 1. The house is not on fire at all, and there is a disruptive, obnoxious man (with KKK ties) on your property, trespassing. 2. Tony set the fire. Either way, you call the police and get as far away as you can.